If you look up the word inception in the dictionary, you will find this meaning - an act, process, or instance of beginning: commencement. However, for director Christopher Nolan it means something slightly different. If you look up the word inception in the dictionary, you will find this meaning - an act, process, or instance of beginning: commencement. However, for director Christopher Nolan (The Dark Night) it means something slightly different. In 2010, he took that concept and applied it to one's subconscious mind and people's dreams. The result was the somewhat controversial yet critically successful film, Inception. Seven years later, the movie has made its way to 4K technology and is available now in a combo pack. Cobb (Leonardo DiCaprio; Titanic) has spent years inside others dreams and subconscious extracting valuable secrets buried beneath the surface. However, this exploration has come with great personal sacrifice. His wife, Mal (Marion Cotillard; The Dark Knight Rises) committed suicide and he is being blamed. He has been banned from the United States and his children and he can never return home or spend the rest of his life in jail. When an Asian Businessman, Saito (Ken Watanabe; Godzilla), offers him a solution, he takes the dangerous job and puts himself and his whole team at great risk. Instead of extracting secrets, the team consisting of Cobb, Saito, Eames (Tom Hardy; The Dark Knight Rises), Arthur (Joseph Gordon-Levitt; Looper), Ariadne (Ellen Page; Juno) and Yusuf (Dileep Rao; Avatar) must enter the subconscious of Robert Fischer (Cillian Murphy; 28 Days Later) and insert the germination of an idea to break up his father's company once it is passed down to him. Of course, this adventure comes with great risk complicated by the fact that Cobb's subconscious and his memories of Mal keep trying to sabotage the group. As it turns out, Cobb feels guilty about Mal's suicide so she keeps appearing in the dreams and causing trouble. In the end, it seems Cobb is successful and returns to his children but the audience is left wondering if he really escaped the dream world or not. DiCarpio is meant for this role as he perfectly fits the persona of a troubled businessman/scam artist. Gordon-Levitt, as his "sidekick" also does a great job. Nolan's muses – Hardy and Cortillard- are well suited to the parts they play with Hardy gravitating towards the "thug-like" muscle and Cortillard portraying the "lost" wife. Page, Watanabe, and Rao round out this group nicely and they all have a chemistry that helps make the unbelievable, believable. If ever a film was meant for 4K technology, Inception is it. The 2160p video quality is exceptional and the CGI work is accentuated by the superb level of detail. The colors are true and clean as well. The DTS-HD Master audio 5.1 is sharp and crisp with explosions echoing throughout the film. The dialogue is well defined and the soundtrack lays a subtle undertone to the film. As with many Nolan Blu-ray releases, the 4K version offers a number of extras that tackle everything from the effects, to the story development to the characters, etc. He does a terrific job of giving the viewer insight into his thoughts throughout the entire filmmaking process and the creativity involved. Some of my favorite details include when the spinning hallway is discussed in great detail. As discussed, the movie wasn't without controversy when it was released in theaters in 2010. While some saw it as a brilliant story with excellent direction, others found it to be confusing and didn't understand the premise. While I enjoyed it, for the most part, I could see the validity of their complaint as one had to spend a lot of time "thinking" about what was happening, which wasn't always possible as scenes tended to move back and forth quickly. However, with time and reflection, it feels as if Nolan offered something fresh and presented it with the highest level of quality. For those who enjoyed the movie originally and who admire Nolan's brilliance, the 4K version certainly won't be a disappointment. 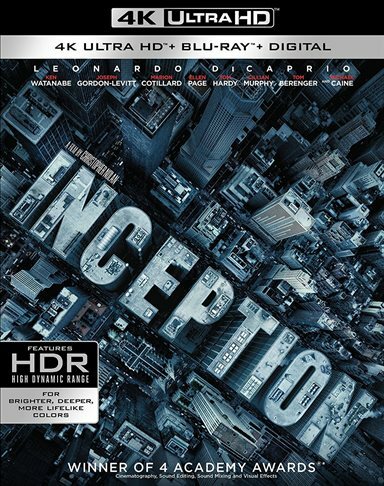 Download Inception from the iTunes Store in Digial HD. For more information about Inception visit the FlickDirect Movie Database.